Navistar International Corp. is rolling out the final installment of an all-new product lineup aimed at growing sales and keeping the once-struggling truck maker firmly in the black. The International MV Series — Navistar’s top-selling model in the U.S. and Canada — is a familiar sight delivering beer and other merchandise on crowded city streets. The revamped medium-duty truck unveiled March 7 in Indianapolis marks the finishing touch on CEO Troy Clarke’s turnaround plan. “As we’ve been introducing these new products, the issues we had relative to quality, productivity, cost and warranty have really fallen to the background,” Clarke said in an interview. 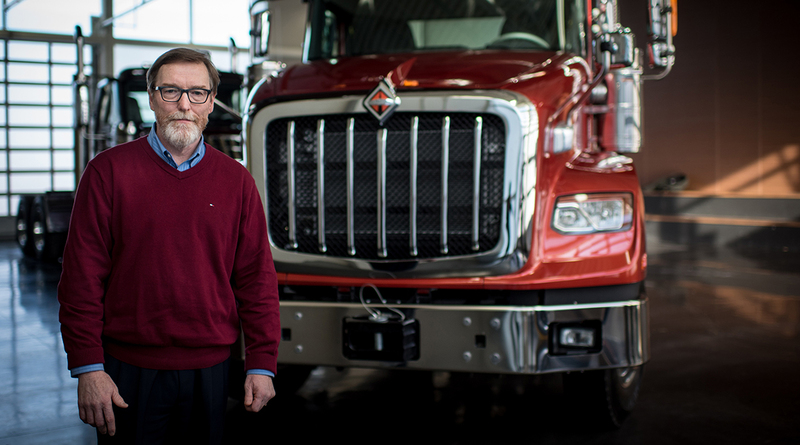 Navistar started a comprehensive product refresh in 2013 while fighting to stay out of bankruptcy. The overhaul has reversed a stock slide that began almost a decade ago when the company tried to lower nitrogen oxide emissions by recirculating exhaust gases through the engine instead of injecting them with urea, like the rest of the industry. Navistar ultimately embraced urea in 2012, but by then, half its market share was gone. Continued gains would be music to the ears of Navistar’s biggest shareholder, billionaire investor Carl Icahn, who holds a 17% stake. Known more for activism than patience, Icahn paid an average of $33.62 for each of his 16.7 million shares starting in 2011, Bloomberg data show. The shares closed at $37.04 on March 7. In a phone interview March 6, Icahn declined to comment on his investment, other than to praise Navistar’s CEO. “I think Troy is doing a very good job,” he said. Right behind Icahn holding 16.6 million shares is Volkswagen AG, which has announced plans with Navistar to bring an all-electric medium duty truck to market as soon as next year. VW is said to be considering an initial public offering for its own truck division, which could encourage the unit to increase its Navistar stake or buy the company entirely, according to David Leiker, a Baird Equity Research analyst. Clarke declined to comment on the takeover speculation. Mid-size, inner-city delivery vehicles like the ones Navistar is developing with VW provide a better opportunity for electrification than over-the-highway freight haulers, since they return to the same warehouse each night for recharging. Clarke predicts that by 2025, Navistar will have more electric trucks on the road than Tesla Inc. But it’s the big haulers — Class 8 trucks — that are really driving the industry’s growth. North American orders for heavy trucks surged 76% in February, the second straight month where orders exceeded 40,000 units, according to Bloomberg Intelligence. Next year could fall short of this torrid pace but not by much, Clarke said. Navistar now has an 11.8% share of the Class 8 truck market in the U.S. and Canada, up 0.7 percentage point from last year. The goal is to “pick up a couple of points a year for the next couple of years,” he said. Navistar, which releases earnings before the market opens March 8, is expected to report an adjusted loss of 29 cents a share, the average of analysts’ estimates compiled by Bloomberg. While commodity price inflation could be a headwind, according to Bloomberg Intelligence analyst Christopher Ciolino, Clarke said proposed tariffs on aluminum and steel won’t impact costs immediately, due to multiyear purchase agreements.